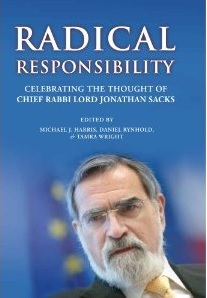 Radical Responsibility is a collection of original essays that celebrate the intellectual legacy of one of the greatest Jewish thinkers of our time, Rabbi Jonathan Sacks. In Radical Responsibility, the contributing writers – thirteen luminaries of Jewish and Western thought (including Revel Dean, Dr. David Berger) – explore themes fundamental to Rabbi Sacks’ lifework: ethics, justice, religion, and leadership. This collection, presented to Rabbi Sacks as he prepares to retire from his position as Chief Rabbi of the UK, brings Jewish tradition into conversation with secular wisdom, highlighting the relevance of Judaism to the dilemmas of 21st century. The book is edited by Michael J. Harris, Tamra Wright and Revel Professor and Director of the PhD program Dr. Daniel Rynhold. Radical Responsibility is published by Maggid Books in cooperation with the London School of Jewish Studies and Yeshiva University Press. To order a copy, see http://www.korenpub.com/EN/products/maggid/philosophy/9781592643660.